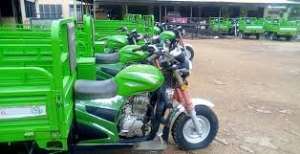 Some aggrieved youth of the New Patriotic Party (NPP) believed to be members of the Vigilante group, Kandahar Boys in Tamale on Monday besieged the offices of the Northern Development Authority (NDA) to forcibly seize tricycles parked within the main yard. Speaking exclusively on grounds of strict anonymity to Bole based Nkiligi 103.7 FM, the youth numbering over 100 forced their way into the yard and insisted on taking the tricycles because they were promised by some appointees in the current NPP government they refused to name. Resistance by the security men manning the main entrance who for the safety of their jobs, insisted the boys followed the laid down procedures if indeed they wanted the tricycles which were procured under the then Savannah Development Authority (SADA) and given to interested persons on hire purchase. hen all attempts to forcibly seize the items failed, they moved together to the Northern Regional Police Headquarters where they were said to have gone to solicit the assistance of the police in taking the tricycles that have also been left for months under the mercy of the weather.